With a month to go till the game's release, it looks like we are finally getting some solid gameplay footage of Operation Flashpoint 2: Dragon Rising's co-op mode. The four player online co-op mode looks like a solid addition to the tactical shooter lineup like that of Rainbow Six and Ghost Recon. The trailer shows off a few different environments, as well as solid team work in different situations. Covering movement, suppressing enemies, and even spotting tanks for assisted targeting are all on display. It all looks very compelling, and very beautiful. Worthplaying recently sat down with the game's executive producer to chat about the co-op mode. In it he called OF2's four player co-op mode the "ultimate experience." That's all well and good, but how does it work? 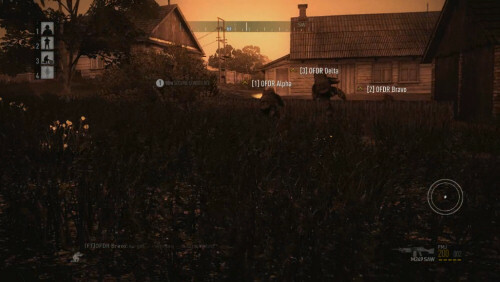 During a co-op game, the host assumes the role of fire team leader and the remaining players choose their role, including medic, rifleman, engineer or anti-tank specialist, via the load out screen. The fire team leader is responsible for issuing specific commands, such as directing suppressing fire, setting way points and instigating flanking manoeuvres. Similarly, if players take control of a vehicle during a mission, roles specific to that vehicle become available, such as driver, commander, gunner or co-pilot in a helicopter. Harcore Shooter Co-Op: ArmA 2 or Operation Flashpoint 2? Page created in 0.3413 seconds.